Welcome to issue #31 — June, 2014. Mike Davis here, editor and publisher. I don’t usually publish reprints, but this issue I have two: alligators by Scott Nicolay, and Stone Cold Fever by Joseph S. Pulver, Sr. I reprinted these two stories because I truly enjoyed them; but I also wanted to bring the books they appear in to your attention: Ana Kai Tangata, and Blood Will Have Its Season, respectively. In addition, this issue contains six more original tales, plus a short graphic novel, our usual Cthulhu Does Stuff Comic, and our column by the legendary Robert M. Price. 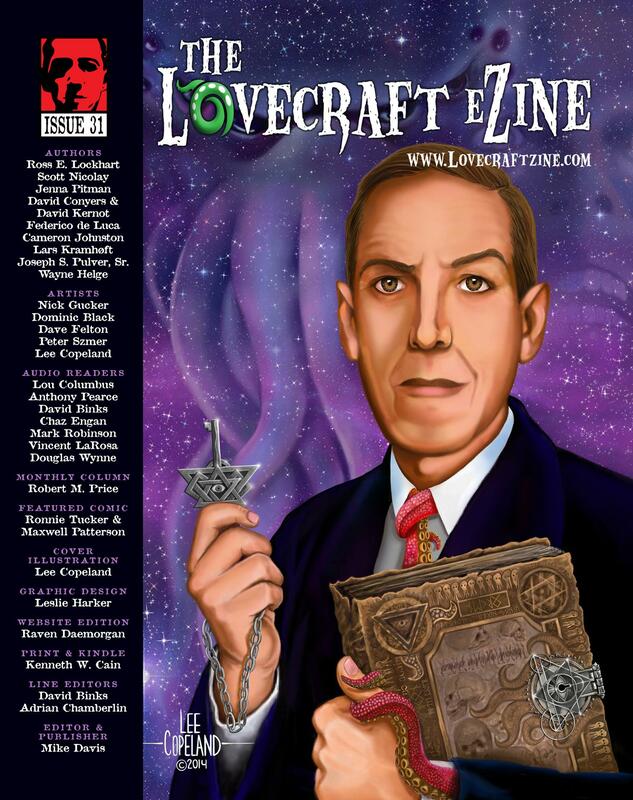 Enjoy issue #31… and thanks, so much, for supporting The Lovecraft eZine. Click here to buy the Kindle edition at Amazon. Click here to buy the Nook edition. Click here to buy the podcast edition of issue #31. Click here to buy the print edition of issue #31. Fedogan and Bremer, a Lovecraftian publisher. Check out their latest book, Ana Kai Tangata. Forever in Pieces: Eighteen haunting visions from Kurt Fawver.